After 12 years Toyota are saying goodbye to the Auris name. Auris is being renamed Corolla – marking the start of an exciting new era for the world’s best-selling car. 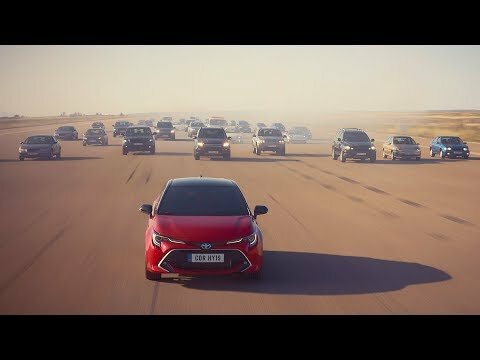 With over 12 million drivers choosing Toyota hybrids including two million drivers in Europe, hybrid never felt so good. You’ll enjoy a supremely quiet drive when running on electric power, as well as its self-charging ability. And you can choose between the 1.8 litre hybrid for a smooth, relaxed drive and a new 2.0 litre hybrid for effortless acceleration and a spirited dynamic drive. Whatever engine you choose, you’ll enjoy a confident, natural drive with the power and precision you demand, thanks to the TNGA platform. Built on the core strengths of a low centre of gravity and a perfectly balanced chassis, it delivers exceptional handling and stability for an unrivalled driving experience. The innovative Toyota Safety Sense package takes driver assistance to the next level. The new Corolla doesn’t just alert you to potential dangers, it actually helps you and supports you in your driving journey. Which means you not only have the peace of mind, but driving also becomes more enjoyable than ever before.